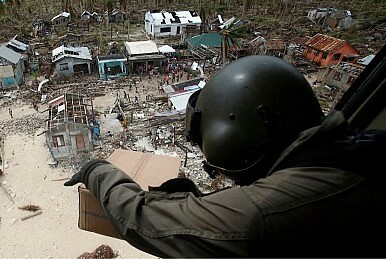 A Philippine Air Force crew drops a box containing energy biscuits to Typhoon Haiyan survivors. The disaster may affect the modernization of the military, with disaster relief favored over external defense. The disaster inflicted by Typhoon Haiyan (known as Typhoon Yolanda in the Philippines) has the potential to significantly shape the development path taken by the Armed Forces of the Philippines (AFP). Like its counterparts in other countries, the AFP is tasked with the missions of both external defense and humanitarian aid and disaster relief (HADR), in addition to its counterinsurgency operations. However, with long-term underinvestment caused by economic constraints, domestic politics, insurgency, and an over-reliance on the U.S., the Philippine Air Force (PAF) and the Philippine Navy (PN) have struggled to maintain their limited number of aging assets, which are unable to successfully carry out either external defense or HADR. The PAF has been without a fighter jet since 2005 and the PN, with vessels of World War II vintage, has severe difficulty defending the extensive territorial waters of the Philippines, as evidenced in recent disputes with China and Taiwan. When it comes to disaster relief, despite the AFP’s extensive experience in responding to frequent earthquakes and typhoons, its lack of capacity for airlift and sea transport limits its humanitarian capabilities in the archipelagic environment. With just three C-130 transporters, a limited number of utility helicopters and a few landing and logistic vessels, Manila is unlikely to be able to deliver satisfactory quantities of materials and other aid to one or more affected areas among the 7100 islands of the Philippines. Thanks to economic growth and territorial challenges from other countries, Manila took a major step toward military modernization with 24 projects this year. These projects imply policymaker concerns about external defense and HADR missions. As the 12 Korean F/A 50 light fighters, two frigates, radar surveillance system, and long-range patrol aircraft are designed to strengthen external defense, amphibious vehicles, multi-purpose assault craft, helicopters and service support ships are geared towards HADR. Unfortunately, given the scale of those projects, either external defense or HADR will not be substantially satisfied and further investment is needed. Generally, equipment for external defense is distinct from that for HADR. With the exception of a few capabilities such as reconnaissance, most weapons systems for external defense such as fighter aircraft do not have the capacity to deliver material and personnel. Meanwhile, vehicles and platforms for HADR, such as amphibious vessels, lack the firepower and mobility to counter external threats. The Philippines’ strategic environment makes this distinction more obvious. In the face of China’s rising maritime forces and clear intentions, any credible defense capability for the Philippines would be reliant on a sea denial strategy, similar as Vietnam has worked on in recent years. Compared to weapon systems for sea control strategy, such as frigates, which have some HADR capacity, most sea denial assets such as missile boats and submarines have no value for HADR because of their limited size. In other words, in looking at military modernization, the two approaches – external defense and HADR – are not compatible and are thus mutually exclusive. Typhoon Haiyan has laid bare the AFP’s insufficient capacity and could well determine its military modernization toward HADR. There are several reasons for this. Geographically, the Philippines usually experiences about 20 typhoons and a number of earthquakes each year. That makes HADR operation much more likely than an armed conflict with a foreign country. Politically, this devastating disaster provides politicians with a good opportunity to boost popularity, sometime that is crucial in Filipino politics. Since voters are likely more worried about natural disasters occurring nearby than about a remote territorial dispute in the Kalayaan Island Group or some other location, political elites may well be motivated to allocate a greater portion of defense investment in HADR. For example, Senator Nancy Binay has argued that funds for F/A-50 light fighters should be shifted to strengthen civil defense. Militarily, to build up the AFP’s capacity for HADR to the extent that it can deal with large disasters is far more achievable than creating a credible defense and deterrence against China’s armed forces. In addition, as the Islamic and Communist rebels continue, any military transport capacity would also be useful in counterinsurgency operations. Moreover, with its long history of military dependence on the U.S., Manila’s motivation to establish a self-reliant defense strategy may be somewhat shakily. Finally, in economic terms, the indigenous shipbuilding industry is mature enough to provide vessels for HADR purposes, and would benefit from HADR-oriented projects. For example, a domestically built landing craft utility (LCU), BRP Tagbanua, has served in a supply role to deliver material and equipment to devastated areas. Domestic interest groups would prefer HADR-oriented military modernization, as the projects would entail more amphibious vessels, transporter aircraft and utility helicopters. There would be at least two potential consequences of the AFP’s HADR-oriented modernization. First, the Philippines would remain highly dependent on the U.S. As the AFP does not possess an adequate ability to defend its territory, the extended deterrence provided by a U.S. military presence would be Manila’s only realistic option. Despite some potential for defense diplomacy with other regional powers such as Australia, India, Japan and South Korea, this disaster has displayed their limited capabilities and long response times in comparison with American counterparts. For example, it took Japan about a week to dispatch its naval ships and 1000 troops, while the U.S. immediately deployed units after the typhoon. Second, the AFP will not have a comprehensive defense capability for external defense in the near future. Assuming current external defense projects are completed, the two Philippine frigates and 12 light fighters will be far inferior to their Chinese counterparts. This does not mean that the Philippines would be completely incapable of defending its islands in the West Philippine Sea. As long as Beijing continues to prefer paramilitary units for territorial disputes, Manila can counter in the same way. With 10 donated Japanese ships and five ex-French vessels, the Philippines will be able to build some capacity for engagements involving water cannoning and ramming in the vicinity of the disputed islands. That capacity would, however, leave Manila very little scope for handling any escalation. Wu Shang-su is a research fellow in the Military Studies Programme, a unit of the S. Rajaratnam School of International Studies (RSIS), Nanyang Technological University. Images from the early stages of the aftermath of the devastating typhoon.